Home > Science is coming to you! The start of the All-Ukrainian Science Festival, which lasted from May 16 through 18 and was dedicated to the 100th anniversary of the NAS of Ukraine this year, was this dynamic. Its central venue was the Yevhen Paton Electric Welding Institute of the NAS of Ukraine, but events within its framework were held in all regions of the country, with over 1,000 activities in total. The NAS was, obviously, the main organizer, with branch academies involved as well, while the Embassy of France in Ukraine was the festival’s principal partner. The NAS of Ukraine is sometimes criticized for its outdated approaches, the lack of modern developments, etc. However, journalists were very few at the opening of the festival, where such developments could be readily seen. Incidentally, many of the developments on display were related to the military industry, as there is a program of the NAS aiming to improve the country’s defense capabilities. At the exhibition, one can learn about new materials for modern weapons and materials for military medicine, which are also eminently suitable for the treatment of civilian patients. By the way, aerospace research can be useful for completely down-to-earth purposes. 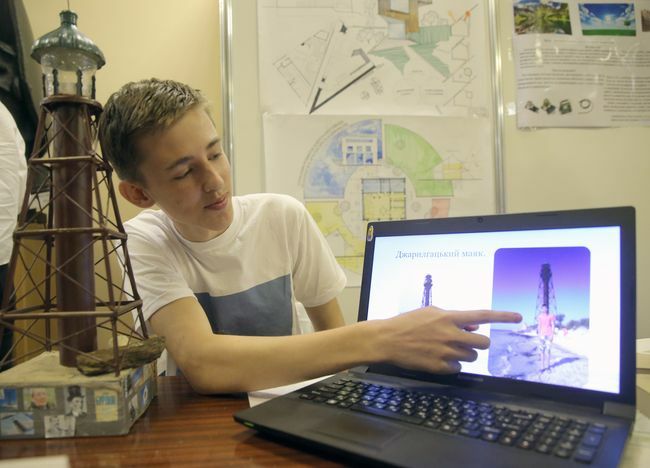 The Scientific Center for Aerospace Studies of the Earth at the Institute of Geological Sciences of the NAS of Ukraine has several interesting initiatives for Kyiv. A modern individual has any number of causes for becoming unnerved. Fifth-grader Volodymyr Trofimchuk is developing, with the help of his teachers, the “Insanity Stop” bracelet, which should prevent nervous breakdowns. The development is at the programming stage, and the student has presented it at various contests, including those held by the Junior Academy of Sciences. It is hard to predict the ultimate fate of the “Insanity Stop” project, but such a bracelet would be in high demand. One way or another, the student treats his developments as an adult should, has learned to recognize their flaws, so we are confident he will come up with another interesting idea.